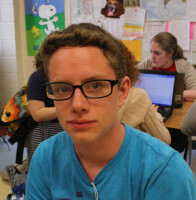 Hello, my name's Ben and I'm the news/web editor of the Southerner. I am also a senior. I like being on the newspaper because it's fun and exciting. In my freetime I like to stare at a wall and wonder how many cracks there are in it, then I count them and see if I was right. So far I have never been right, sometimes there are no cracks at all, sometimes there are a lot, but almost always there is a wall.